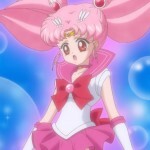 The latest English dubbed episode of Sailor Moon Crystal is now available on Hulu and Neon Alley. We’re almost at the end of the Black Moon story arc this week with Act 25, Showdown – Death Phantom. 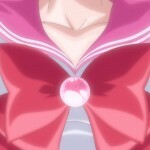 Sailor Pluto stops time which is a taboo and the consequences might get Diana a full time job. 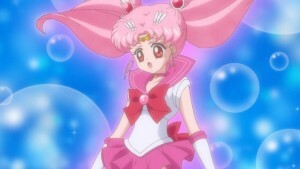 Chibiusa finally became a Sailor Guardian this week as we see her transformation into Sailor Chibi Moon. Next week is the last episode of this story arc and it will also be the last English dubbed episode we’ll likely see in a while. 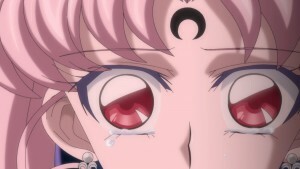 The new Infinity episodes of Sailor Moon Crystal won’t likely be dubbed for some time. 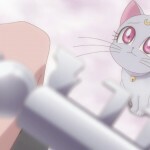 This entry was posted in Pretty Guardian Sailor Moon Crystal (2014) and tagged Sailor Chibi Moon, Sailor Moon Crystal Act 25 - Showdown – Death Phantom, Sailor Moon Crystal English Dub, Sailor Moon Crystal Phase 2 - Black Moon by Adam. Bookmark the permalink. 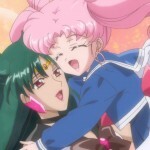 Next Friday is one more episode, and we still haven’t gotten any news about the English Dub of Season 3 of Sailor Moon S.
This means we can get back to the redub. 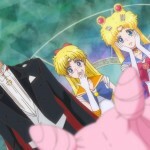 Sailor Moon Crystal was interfering with them working on the redub. I can’t wait to finish the English dub of this season. I think season 2 is a little more interesting than season 1. I did like that queen beryl thought about getting the crystal for herself though. I am guessing wiseman is getting revenge from being banished in this season. 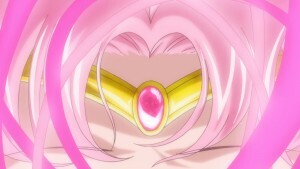 I hope they work on the 3rd season of crystal but I believe they need to give at least a year to half a year because they cannot release the product when the Japanese Blu-rays sets haven’t even been on sale in Japan until a while after broadcast. They need to let people buy the Japanese blu-Ray set release before they can dub it so that toei animation gets the money first, I believe. I hope s will be released soon I believe in the middle of May probably because the r part two was released a while ago now.